I’m hoping to find Schmidt family members on that film (although it’s a long shot). The Church of Jesus Christ of Latter-day Saints. Genealogical Department. Roggow, Brandenburg, Prussia births or christenings (1622-1767) : A thru Z. Salt Lake City, Utah : Filmed by the Genealogical Society of Utah, 1978. 1 reel of microfilm. Alphabetically arranged parish register extracts for Roggow B (Kr. Regenwalde), Pomerania (not Brandenburg as stated in title), Prussia, Germany; now, Rogówko (Łobez), Szczecin, Poland. Extracted from film 905037 item 4. Batch # C99880-1. Which may have Kamrath family members on it. They were from Roggow, Pomerania… the question is whether this is the right one or if anyone we recognize will be in there. Kahlen, Kohlen, Calem…..or Wandau, Wanden, Wansen…. that all are guesses, speculations, you need to know exact places of birth and marriage to find anything. I agree with him Perhaps the only way to be sure (unless someone has a box with documents from the old country) is to find the family in Prussia before they left. The Zierkes arrived in 1865. The Schulz siblings (Wilhlemline and Martin) came in 1866. The Strehlow family came in 1868. Heinrich Krueger got here in 1881 or 1882, his brother Carl in 1883. The parents Wilhelm and Caroline Krueger came in 1883. The Kamraths came in 1885. Wilhelm Schmidt came in 1885 and his mother and five sisters in 1892. So I think that about 1860 and 1870 are the best times to look for them. So now I guess the best thing is to look for census records for the “Candidate Towns” and try to find them. Did you order LDS Film No. Europe 0245492 yet ? Do you think, that LDS also can offer these dates ? I have no experience with LDS. Oh, sorry, I just learnt you can order films from Wirsitz there. Did you ? LDS is a great help and I just have found out, that a Mormon church exists in Bonn where I live. I didn’t know it before. I have no experience with ordering LDS microfilm, so I’m going to ask Jeannie Halversen about this. I believe she has experience with doing that. Otto Prielipp was a German/Prussian immigrant who came to the US in 1922. In 1923, my great-great-grandfather Wilhelm Schmidt paid $164.98 for Otto’s brother Emil Prielipp come to the US from Germany/Prussia. [Gornitz was in the Prussian Province of Posen, but I believe technically after WWI it was considered Germany.] Both men worked in the paper mill with my great-grandfather Edwin Schmidt, and both lived on Grand Avenue in Rothschild, Wisconsin(as the Schmidt family did). Gloria and Kay Johnson were friends with the Prielipp daughters. It’s not clear if Wilhelm also paid for Otto to come to the US. 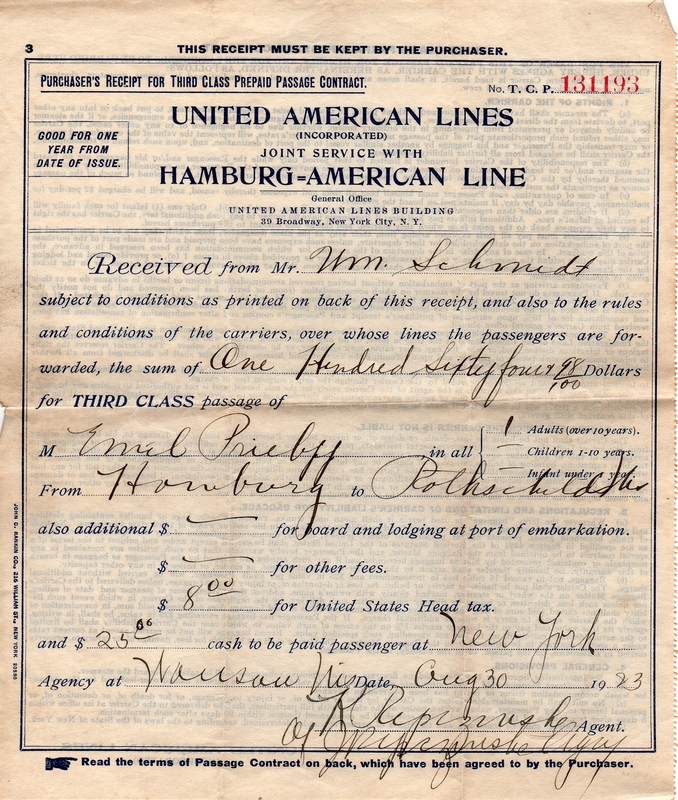 Ticket for Emil Prielipp to the US from Gornitz, Prussia. On the passenger record for Emil Prielipp it gives his home town as “Gornitz, Ashebude, Germany”. Gornitz is the town where Wilhelm was living from November, 1884 until he came to the US in the second half of 1885. “Ashebude” (actually Ascherbude) is a small town near Gornitz. Emil sailed aboard the “Albert Ballin” from Hamburg, Germany on 8 Nov 1923, arriving in New York harbor on 18 November. His destination was listed as “Rothschild, Wisconsin”, and his father was listed as Hermann Prielipp, and his trade as “blacksmith”. Emil’s brother Otto left Gornitz in 1922 on board the “SS Mount Carroll” which sailed from Hamburg, Germany on 29 Jun 1922 and arrived in New York on 11 Jul 1922. Otto was listed as a “Farm Laborer”, father Hermann Prielipp of Gornitz, and with a destination of Wausau, Wisconsin. I’ve asked Gloria to try to get me in contact with Otto’s daughters. My hope is that they know something about the relationship between their father/uncle and Wilhelm Schmidt, and perhaps even have some knowledge (even if it’s just family stories) about Gornitz. UPDATE: From further records discovered by Doris Winkelmann Sonntag and Marlena Krzemińska, we now suspect that Emil Prielipp was the grandson of Hannah Auguste Friedericke “Friedericke” Winkelmann, who was the sister to my 3x great-grandmother Wilhelmine Winkelmann. So Wilhelm Schmidt may have been paying for the passage of his first cousin, once removed. It seems probable that Emil’s father Hermann was Wilhelm’s first cousin, and may have written to Wilhelm to ask for help getting his two sons to the US.